Did you know that the greatest book on American birds was the work of a Frenchman? The ornithologist and artist James John Audubon was born in Haiti in 1785 to a French father and grew up in Nantes. At 18 he moved to America where he made his name – and a profound contribution to natural history and environmental studies. His legacy of four enormous volumes - The Birds of America - depicts life-sized images of every bird he could see, shoot, stuff, paint and portray between 1820 and 1838. Grolleau and Royer’s marvelous book is a thrilling introduction to a crucial moment of history. 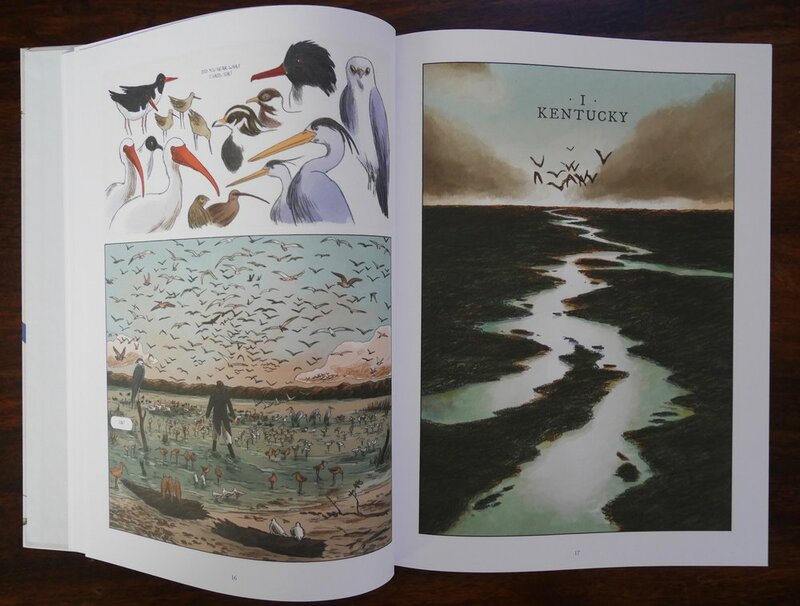 The life of James John Audubon is brilliantly captured in this bande dessinnée, first published in France in 2016 and now in an English edition by UK champions Nobrow Press. In Audubon: On the wings of the world Fabien Grolleau and Jérémie Royer bring storytelling and design smarts along with real empathy for the subject in a book for teenagers and older. And like the subject himself, their book proves to be another valuable French export. The story by Grolleau and Royer begins in high drama and never slackens. As James Audubon and co. are drifting downriver focused on the birds above, a massive storm is heading their way. Desperate to save his sketches, and their own lives, the party scramble ashore and take refuge in a cave. Here Audubon broods upon his misfortune until he sees in the gloom an owl staring fixedly at him. So turning disaster to profit, he passes the storm by drawing the patient bird. Aubudon's life work really began after businesses failed and he was gaoled for bankruptcy (oh, that Donald Trump were gaoled for his!). Funded in large part by the work of his teacher wife, Lucy, he travelled for more than a decade in America and then to England drawing, painting, researching, writing and publishing Birds of America. During this time Lucy raised children (two others died in infancy) and endured years of isolation. There is something of the 'grand folly' in Audubon's story, a relentless pursuit of a noble cause. In his driving obsession and determination Audubon reminds me a lot of the explorer Matthew Flinders, the first to circumnavigate Australia. Sailing back to England, Flinders was imprisoned by the French on Mauritius for seven years, and died soon after his eventual return. "Swamp fever" was just one of the sicknesses Audubon suffered in his grand pursuit. American institutions found his work too romantic, not sufficiently scientific and his rival Alexander Wilson was in the ascendent. But the English couldn't get enough of Audubon's dramatic images and provided willing support and financial subscribers. Audubon’s book was published in 87 parts then finally gathered into four volumes - double elephant folio size – each over one metre high. You might say Birds of America is an early example of crowdfunded global publishing with a strong environmental theme. Plus ça change, non? Alexander Wilson enjoyed the support of institutions and prolonged Audubon's struggle. Grolleau and Royer's book includes examples from Birds of America. Today, the State Library Victoria has the complete bound set of Birds of America on permanent display in the Dome Galleries. (Matthew Flinders' map of Australia is in the same room.) When I dropped in recently, the page displayed was the bird of Washington, about which there is some dispute. The Library’s copy was purchased for £100 at a knock-down price from teacher William Stallard by Sir Redmond Barry (best known as the judge who sent Ned Kelly to the gallows). More recently, Aubudon’s Birds of America changed hands at Christies for about US$8 million. Winner of the 2016 Best bande dessinée at the Festival International de géographie. Born in 1972 Fabien Grolleau trained in architecture and has written numerous bandes dessinée for publishers including Delcourt, Sarbacane and Daguard. He is the editorial manager for the independent press Vide Cocagne, which he established with Thierry Bedouet in 2003. The company is based in Nantes, the same city James John Audubon lived in growing up in France. Jérémie Royer was born in Paris 1979 and grew up in Nice. He trained in advertising design in Nice before moving to Paris to extend his career, then studied for two years at l'école de bande dessinée Saint-Luc in Brussels. He is part of the studio l'atelier Mille. Jérémie and Fabien worked on Audubon: On the wings of the world for three years. For more on the original book see the Audubon Society website. Mother Fox and Her Cubs is like a cheeky, upbeat version of the English classic Owl Babies. But rather than awaiting the return of night hunting mother, here it is the young ones who hide, and it is the reader who does the hunting. George Laurent doesn’t want to fly anywhere. The beauty of the Arctic tundra, the Caribbean, and Paris at night simply means nothing to George, despite all the urging of friends. And why not? He’d prefer to be at home baking scrumptious éclairs, carrot cake and brownies, learning yoga or playing guitar. Jullien’s work often has a trompe-l’œil quality, and he seems to delight in muddling perspectives as much as he thrives on mixing materials. In many of his pictures we are invited, or slyly challenged to ask, what exactly it is we are seeing? Jullien used this quality to brilliant effect in Hoot Owl, Master of Disguise (Candlewick 2015) his book with Sean Taylor. French edition on the left, US edition by Enchanted Lion on the right. Translated by Claudia Zoe Bedrick. The sun has set across the pond and a little frog named Jeremy is feeling sad. He is about to be tucked in to bed by his loving mother, and Jeremy doesn’t sleep well. He goes through his nightly routine: wash hands and face, brush teeth, put on pyjamas (mother doing up his buttons), toilet and then…the dread begins. So begins a night of restless that ends with moments of pure magic from the master hand of Kitty Crowther. Tucked up and snug after a volley of hugs and kisses and reassurance from his mother, it is not long before anxiety of a kind the young Marcel Proust recalled. Is it a noise Jeremy hears, or is it just his imagination going “scritch scatch scraww plop”. Even though his father will lovingly reassure him, even snuggling in with him, Jeremy is distraught and it’s not very long before he hears noises and imagines all sorts of terrors. Back and forth goes Jeremy – and his parents – as fears and phantoms flash through the little frog’s thoughts. The night wears on…how will Jeremy get to sleep? His parents never lose their cool and eventually he climbs into his parents’ bed. Good for Jeremy, bad for Father, who climbs into the child’s bed. But now Father hears something! Two books spring to mind when I read this. One is the Bedtime for Frances by Russell Hoban and illustrated by Garth Williams, with its patient and sometimes exasperated parents trying to desperately to calm their child’s over-active imagination. The other is of course The Tale of Jeremy Fisher by Beatrix Potter. When we see this little Jeremy at home and ankle deep in water it is impossible not to smile. The US edition is missing the dedication to Jeremy Fisher, but it is there in the Pastel/l’ecole des loisirs edition, along with the artist’s dedication to her father. I won’t spoil the story by revealing the finale since there are moments of delicious magic that can only be experienced in the book, and not explained or broken down in a review. It’s about the page-turn, the reveal, the silence and the moment. For those lucky enough to discover Scritch Scratch Scraww Plop! it’s sure to become a bedtime favourite. In the end, Jeremy not only overcomes his fears, but shares something wonderful with his father. 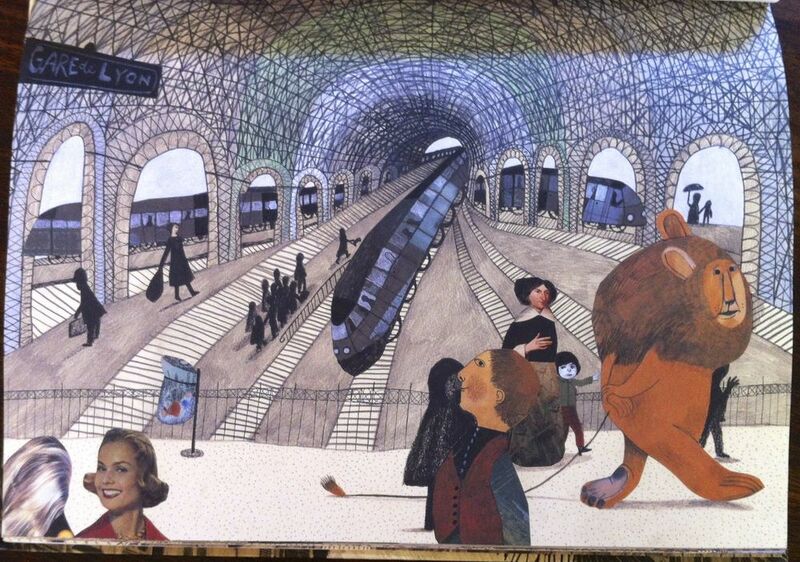 For more about Kitty Crowther see my interview here. If diversity is a theme – or indeed a project – of children’s publishing today then Tomi Ungerer must be considered a pioneer and a champion of the cause. The creator of Three Robbers (Trois brigands) has celebrated outsiders and pushed the boundaries for more than half a century. Since 2008, English language publisher Phaidon Press have been steadily reissuing his books in beautiful, and very affordable, hardcover editions. Phaidon's Tomi Ungerer reissues are superb productions. Chapeau! 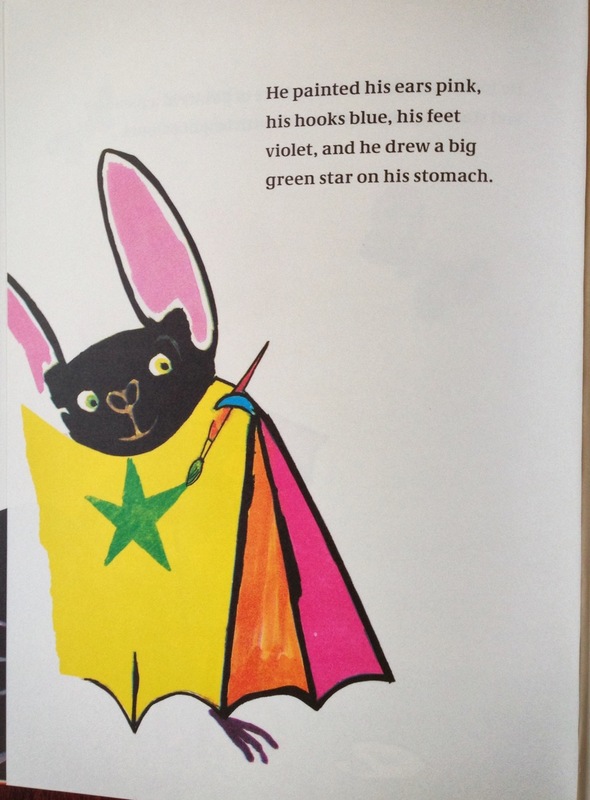 By the time that Rufus The bat who love colours was published in 1961, Tomi Ungerer was already well on the way to being an established figure in children’s literature. Crictor, the tale of the unlikely friendship between a boa constrictor and an elderly lady published in 1958, appeared on numerous awards lists, including the Horn Book Fanfare Honor List and the ALA Notable Books. Rufus appeared in the same year as The Three Robbers. Let’s just say that writer’s block was never a problem. Rufus absolutely rocks with colour, from the moody night scene of the cover, through the orange hardcover jacket, the vivid yellow end papers and Rufus’s startling plunge out of the cave and into the daylight. Breathtaking! Clearly, Rufus is not a bat to go gently into that good night. No, he finds an abandoned palette and paints himself in spectacular colours, like the birds and flowers he seems all around him. But this strange and wild creature frightens the earth-bound types threatened by the unknown. Luckily, Rufus is found by a butterfly collector, Dr Tarturo, who believes that he has discovered a rare specimen. Realising his error Dr Tarturo takes care of Rufus, nursing him back to health and creating a lifelong friend who care share his passion for wild and unusual creatures. Ungerer’s pages have a freewheeling energy that more than 50 years cannot dim. In part, it’s the economy of the storytelling and the text. In part, it’s the visual economy honed in advertising and magazine work. And in part it’s Ungerer’s own impish wit and style. The modulation of light and dark, of colour and white space, is a little master class as the reader moves through the pages. There is a saying that ‘the best picture books don’t work on radio’, and it was never truer than in Rufus as it moves from caves to night skies, dazzling daylight, dim basements and living rooms and sunlit gardens. Rufus, not your average bat. I suppose there are a number of anachronisms that children today might need explained. What is an open-air cinema? Why are they watching a black and white television? Let’s agree that this is part of the magnificent, vibrant and surprising world Tomi Ungerer creates and which will endure for many, many more decades to come. Standing out in a crowd comes with a cost. To return to the theme of diversity, one thing that helps sustain Rufus and many of Ungerer’s best books is that if there is a message, then it is wound tight into the story and characters. There is nothing didactic in this book. Rufus is not a symbol for anything other than his own curiosity and joy. This is Ungerer's best response to the punishers and those who would impose rules upon our human freedoms. Rufus is a lasting delight. Tomi Ungerer is a giant of book illustration. Born in Strasbourg in 1931, Tomi Ungerer grew up under Nazi occupation, after Hitler’s armies took over the Alsace region. The precocious Ungerer recorded these events in detailed and nuanced drawings, pictures that survive to this day. After liberation in 1945, the French authorities reasserted their presence. Yet Ungerer felt alienated all over again. Aged 25 he left Europe for New York City, where his career as an illustrator quickly took off amid a boom in magazine publishing. 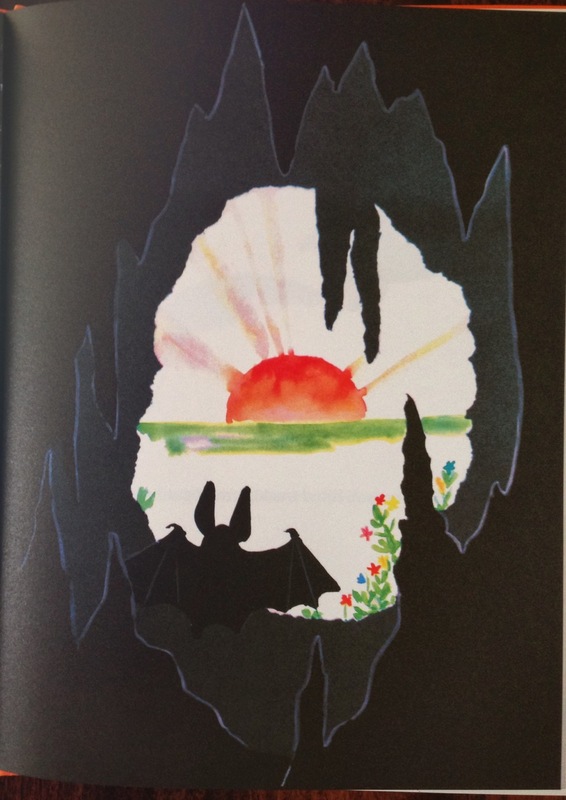 There are few, if any book illustrators of Ungerer's stature, whose work is so widely known. Maurice Sendak said that without Tomi Ungerer there would be no Where the Wild Things Are. "Tomi influenced everyone," Sendak said. After twenty five years in the United States and Canada, Tomi Ungerer and his family moved to Cork in the west of Ireland, reconnecting him to Europe. He has been a tireless campaigner for French-German relations. Among many, many awards he was awarded the Legion d'Honneur in 1990 and the Hans Christian Andersen Prize for Children's Literature in 1998. His life is documented in the film Far Out is Not Far Enough. It's a fascinating and frank portrait of unique and important artist. It's well worth chasing up. Visual literacy! the kinder teacher exclaimed as she leafed through the pages of Who Done It? in the bookshop where I work. Who Did It? provokes a series a series of questions, and answers are not always easily found. Questions include: whose arm hurts, who’s shy about dancing, who is in love, who forgot a swimsuit, who played with that mean cat, and who couldn’t hold it? The book is to some extent a study in motive. Why, the reader asks, is the character doing what they do? The poker-faced characters suggest the world Charlie Brown in silent form. Who didn’t get enough sleep? is the opening question. Ten characters including a small bird stare more or less directly at the reader, challenging us to work out just where they are in this moment. A wide smile on the boy in blue suggests he slept well, but what of the bleary-eyed bear leaning on the lounge? Or the boy in the Zorro outfit – perhaps his activities are nocturnal? The pleasure of the pages is that while the reader can usually confirm one certain figure, there are several others that could fit the frame. Why is the boy smiling? Did he eat all the jam? French jam will do that to a boy. In this way Who Done It? is more than a beginner’s game of Where’s Wally? In the panels Who ate all the jam? we observe a range of contented and oblique behaviours. Is someone hiding something from us? That orange furred bear lying flat on his tummy, for instance? Or is it the last boy in the panel strolling nonchalantly out of the frame, a fringe of hair masking his eyes? There’s a gentle pleasure in the spaces between, too. Illustrator/author Olivier Tallec, working in pencil and acrylic paint, establishes enough movement with subtle addition of shading that ground and animates each figure. The white space separates and harmonises the gallery. The book's flip-up format suggests an artist's sketchbook, or detective's notebook, as each character takes their place in the line-up. In finding an answer to the questions, readers will ask questions about motive, what is revealed and perhaps what is concealed or hinted at. Questions such as ‘Who is in love?’ might lead to questions about how we behave when we are in love, and what it is we can love. Can we love our toys, or skateboarding, or wearing a Superman costume, or going on a picnic? The scenarios reflect a range of situations and challenges that a young child might meet. Children aged from four and up delight in Who Done It? So too will adults as this elegant parlour game defies age categories. The last page of the book provides an answer key, though I’m not sure that was absolutely necessary. I suppose it might settle any disputes, but it’s in the nature of the book that one answer may not exclude other possible readings. Who Done It? will most certainly enhance visual literacy and also develop language and critical thinking skills. The text only poses the question, so readers will have to talk about the possible answers and alternatives. You might say that for the reading child, philosophy begins in the kinder. Olivier Tallec was born in Brittany in 1970. He graduated from the École Supérieure des Arts Appliqués Duperré in Paris. His work has appeared in many newspapers and magazines, and he has illustrated more than 60 books for children. He lives in Paris. Tallec came to children's books by chance at the invitation of a publisher. "The most important thing for me is to tell a story within the story", Tallec says. Two books about childhood fears - monsters and wolves in this case - which, at least on the surface, could not be more different. I Am the Wolf...And Here I Come! I Am the Wolf...And I Here I Come! is a chunky little board book, a solid brick of a thing. Just ten images (plus the front and back cover - more of that later), are enough to create a sharp, squeal-worthy finale. The images have a primitive feel, the wolf's grey fur wrapped in a ragged, rapid black line. There's an energy to the drawing that lends movement to the pages, and just a touch of texture in the solid blocky colour. This is not a book that will appeal to every child - or perhaps more accurately - not every parent. Look beyond the brash colour palette, the simple narrative and sturdy pages however and you will discover a book built to thrill and delight. I will admit to being a little freaked out by I Am the Wolf...And Here I Come! But on second and third and even fourth reading, I realise that the brash, cheeky style has great child appeal. Having boldly introduced himself on the first page the wolf immediately prepares for the day - or night - ahead. This wolf is, frankly, something of a dandy, with his jaunty boxers and stripy socks. His red top suggests the connection with Little Red Riding Hood, before pulling on his big boots, a fetching hunter's hat, and finishing with a sinister long black coat. But each turn of the page (from bottom-to-top, not the usual right-to-left), build the repetition and reveal. We know that Mr Wolf is getting closer. The last page parents is certain to bring gasps and shivers in young readers, so this one is definitely best read on the lap of a parent. I Am the Wolf...and Here I Come! is a funny, rowdy romp. The coup-de-grace actually comes in fact on the back page, which encourages the child to snap the book closed and keep the wolf inside. The physical aspect of this little book can't be underestimated. I Am the Wolf allows a child to take control moments of anxiety and fear. For one, we can laugh at the wolf with all his fussy dressing. Don't we also get dressed just like this? The wolf mixes the strange with the familiar, and there's even an absurd element as he goes about his routine. But in the end a wolf is a wolf, and that daffy smile reveals some big teeth and a hungry mouth. So maybe we should be afraid. How to contain our fear? Quick - snap the book closed! Tickle Monster by Édouard Manceau takes a different path in putting fears to bed. You might say that Manceau's book deconstructs our fear of monsters, since that is exactly what the reader of this book does in a series of challenges thrown out to the monster. (The French title for the book is Gros Cornichon, which is perhaps also a play-on-words for cochon or 'pig'.) But whatever it's called, the aim of this book is to inspire fun and creativity. What's brilliant about Tickle Monster is the way Manceau uses visual language to tell the story. With each provocation from the reader beginning If I...the answer is resolved by removing that part of the monster and turning into something else. So the work of challenging the monster is done with the eye, the imagination and by language. It's an active tussle that takes place with each turn of the page. And with each turn of the page, the monster reduces and is transformed into something both commonplace and extraordinary. Once again simple drawing reveals a skilled design in the service of the story. The images and shapes look like paper collage - something a child can make with just scissors and coloured paper. The black pages suggest that this is a story for bedtime when fears can rise. 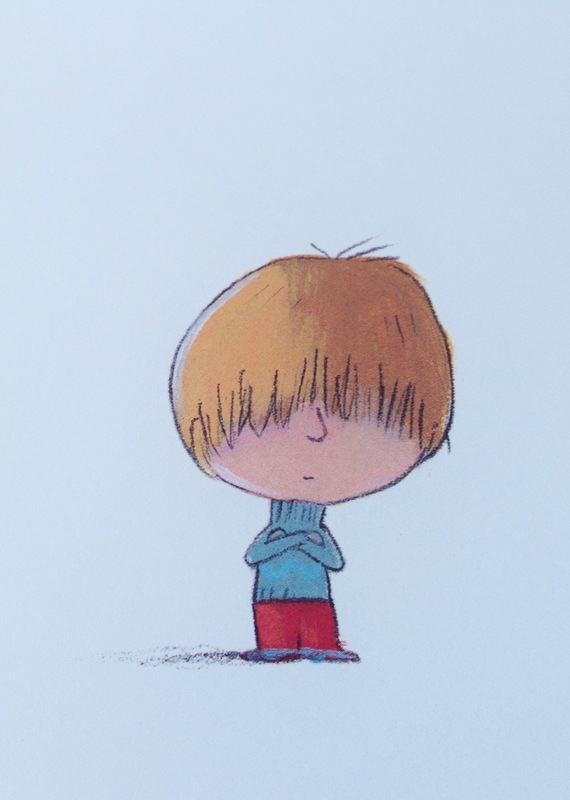 Think of Bedtime For Frances by Russell Hoban and Garth Williams as a classic of the genre, but here the child or reader has greater agency and controls the outcome with a less parental intervention. The end result is that the sharp-toothed monster becomes a figure of fun, which the child can master. The wild-eyed beastie from page one looks a little less wild when we turn to the final spread. And while we wave farewell to the monster, I am sure we will see a lot more of Édouard Manceau. Édouard Manceau is a prolific illustrator and author with more than 100 titles to his name. Most of his books are for preschool children. His books have been published widely outside of France, including in Germany, Catalonia, Spain, Italy, Norway, Portugal, Korea, China, the United States and Canada. Explaining his approach to making books, Manceau told L’Express: “I want (my readers) to be actors because to be a reader is to be an actor. Henry Miller said, in regard to clowns, ‘The clown is the poet in action, he himself is the story that he plays.” And so this is what I try to give to children. In playing, I feel we must play deeply.” All this is fully evident in Tickle Monster. Bénédicte Guettier was born in Paris in 1962. In 1985 she obtained a ‘diplôme supérieur’ from l’Ecole Nationale Supérieure des Arts Appliqués, followed by two years at l'Ecole Supérieure d'Arts Graphiques. She works in illustration for numerous magazines and creating drawings, prints and posters. With great inventiveness he has written and illustrated over 250 books for young children. Bénédicte is also the creator of Trotro, a highly popular series recently adapted as a stage musical. If it’s true that readers are made on the lap of their parents (and I am sure this is so), then a really good touch-and-feel book will help create that essential bond between the child and parent. Xavier Deneux’s My First Touch and Feel: Words Book is certainly something infants and parents will enjoy together. There are at least four levels of interaction to explore: the image, the word, the pairing and of course the textures. The fun begins even before the first page. That smart red tunic on the cover is soft velour, so the child reader is already exploring the book from the moment we pick it up. Rounded corners make the book more comfortable to hold. The cover's red, blue and white colour palette is not gender specific and the figure is not strongly gendered either, which is to be applauded. What’s inside? We encounter five paired images: a cat, a dog; a house and a hatching chick; a bicycle and a car; shoes and socks; and a ball and baby. While dominant colour palette is black and white with red highlights, primary colours are introduced, which will appeal well to young eyes. The opening spread is a simple, bold combination. Some of the word pairs probably work better in French, as some of the English words miss the alliterative qualities of the original. It’s not a problem, but just a necessary quirk of translating simple nouns. For the touch-and-feel textures, each right-hand page offers a new sensory experience – and each one is an opportunity for the older and younger reader to talk and interact. The dog has a soft, velvety ear. The car has a ridged surface, and by strumming your finger upon it, the car will make engine sounds. The final page offers a soft grow-suit for a little baby, and affirms the child-centred experience of this delightful early stages book. Bayard saw that Chronicle had been successful with English-language editions of some of their titles (ed: including Hervé Tullet), and wanted to get their feet wet in the U.S. market. What’s special here beyond the usual distribution relationship, where the distributee publisher shows up with a bag of books and says, ‘Here, sell them,’ is that Chronicle’s editorial and marketing teams entered into discussion with their counterparts at Éditions Tourbillon to help fine-tune the Twirl list and select titles we thought would be right, not only for the North American market, but the U.K. market as well. And presumably for everywhere else English is spoken. Thanks to Leslie Lambert at The Little Bookroom, where I bought the book. I look forward to exploring more from Twirl Books soon. You can see the complete current list here. Xavier Deneux lives and works in Paris. He specialises in designing and illustrating books for young children. He studied at Beaux-Arts de Paris and then took a diploma at the ecole supérieure des arts graphiques. He worked as a graphic designer, producing posters and decorations before dedicating his career to picture books. He has since created more than 50 titles. It would be difficult to find a more self-centred hamster than the one starring in this illustrated story. It’s a kind of extreme ‘Tales From the Riverbank’, where the hamster has all the charm of Toad of Toad Hall and is every bit as brazen. Hamster introduces himself to us by dropping in on his friends' picnic. This is hotly followed by an invitation to read his friend Mole’s novel. But the novel is far too boring and Hamster imposes his own reading on the story: The hamster lit up the clearing. Each morning, a hedgehog and a mole smiled at him – as if to thank him for being there. Hamster’s egocentrism is so startling I found myself compelled to read on! We travel with Hamster and friends from their clearing in a European forest home to the Arctic Circle, where he and his friends go on holiday. This beautifully drawn story unfolds in short, sharply crafted scenes. At 128 pages, it is a type of book we don’t often see from English language publishers. The text is concise: it’s pure dialogue, like a great film script. The visual design and characters are integrated and sustained. Illustrator Pauline Martin began her career in graphic novels (bande dessinée) and it's clearly a strength of the book. The combination of image and text results in a book that is part picture book, part comic. It’s a sophisticated delight, as accessible to beginning readers as it is rewarding to the most able, adults included. Besides the bumptious Hamster, the rest of his friends are utterly charming. These include Snail, who the Hamster requires to make a space craft from wood and nails; the irrepressible Mole; a red squirrel; a white rabbit (non-magical), and a very friendly bear. Together the group goes on holiday to the North Pole and there meet a polar bear, a whale and an emperor penguin (okay, penguins live in the Antarctic, but let’s not quibble). The encounters between creatures of different places leads to some thought provoking, funny and philosophical conversations. The use of white space in book’s design is a natural fit for the frozen landscapes. Travels of an Extraordinary Hamster ends with all safely returned home and the promise of further adventurers and I cannot wait to join them. Pauline Martin was born in Paris in 1975. She attended the l’Atelier de Sèvres in Paris, and then l’institut Supérieur des Arts Appliqués, where she was mentored by Killofer and Dupuy-Berbérian. For many years she as a graphic designer for a publisher and explored her own ideas through drawing. Her published books include La Boîte and La meillieure du monde (published in English as The Best in the World). Pauline Martin illustrated Leonora for the celebrated graphic novelist David B. Today her illustration work is dedicated to children’s books and is published in France by Albin Michel Jeunesse. Translator Ann Drummond in association with First Editions Translations Ltd.
Kitty Crowther is interviewed for French Picture Books here. Mia is a busy, energetic and curious-minded creature and Poka her patient, doting and occasionally put-upon father. When Mia and her father Poka stop for a rest while out walking one day, a football (soccer) game catches Mia’s eye. Before you can ‘Astrid Lindgren Award winner’, Kitty Crowther’s adorable duo head off to buy football boots. Mia’s first time on a football pitch, and fitting into the all-boy team, proves trickier than it looks: training ends in massive frustration and mild scorn from her would-be teammates. Worse, Mia must wait for all the boys to leave before she can have a shower. But she won’t give up and soon irrepressible Mia has a solution. When Saturday comes, Mia is ready: nervous, but ready. Everything turns out for the best, and, walking home after the match, Mia spies a ballet school. 'Prepare to be surprised and to challenge stereotypes' is the message of this book. Like Shaun Tan, (another Astrid Lindgren Award winner), Kitty Crowther conjures up worlds and creatures you won’t find in an encyclopedia; birds, insects and other animals defy categorisation and have a life of their own. In the six-legged world of Poka and Mia no two characters are the same and creates a space of play and possibility. Crowther’s impish sense of humour makes all of her books a lasting pleasure. Hopefully The Poka and Mia books are a delightful entrée to the world of Kitty Crowther, an artist vastly under-appreciated by English-language readers. I can only echo the words of The Gruffalo illustrator Axel Scheffler who has blurbed the series. “I’ve admired the enchanted world of Kitty Crowther for a long time and I’m happy that English speaking children can now get to know it as well.” Play on! Kitty Crowther is not an artist easily pigeonholed. She was born in 1970 to an English father and Swedish mother, Kitty grew up in Belgium. She publishes mostly with French-based Pastel/l'ecole des loisirs. Her first book, Mon Royaume, appeared in 1994. She developed and nurtured her talent for writing and illustration at l’Academie des Beaux-Arts in Brussels and further studies at l’Institut de Saint-Luc, where her talents were recognised and encouraged. She has since published more than 35 books. Her illustrations have a soft line and hand-made look. The line is full of feeling and her use of colour is integral. Her stories seem to plunge effortlessly into a deep well of myth and folklore. While she predominately uses coloured pencil, her employment of white space is crucial to her books, inspired partly from a childhood love of Beatrix Potter. The images are don’t seem to be prettified; her line and colour maintain the intimacy of the artist’s hand. In September 2015 US publisher Enchanted Lion releases Scritch, Scratch, Dip, Clapote! under the English title English title Scritch, Scratch, Scraww, Plop. But any publisher taking on her books like Alors?, Mère médusa, Le petit homme et Dieu and Annie du lac would be doing English speaking readers a great favour. Like Shaun Tan, Kitty Crowther revels in creating creatures that you won’t find in an encyclopedia; birds, insects and other animals that defy categorisation have a life of their own. Such creatures populate the world Kitty Crowther makes, enticing the reader to enter further in. I think that perhaps it’s the way her art can draw upon a sense of tradition, yet transform into something deeply personal and original makes her so special. She has an impish sense of humour that makes all of her books such a pleasure to read and reread. Interview with 2010 ALMA laureate Kitty Crowther. Award week in Stockholm, May 2010. At the Same Moment Around the World takes young readers on an imaginative journey and rounds it off with two wonderful ‘extras’, creating an intriguing blend of fact and story. We begin in Dakar, Senegal, (a former French colony) at six o’clock in the morning. Keita wakes up early to help his father count the fish caught during the night, while a ship edges towards the shore. Turn the page: it’s six o’clock we are in Paris as Benedict drinks hot chocolate before school. In the street the day is already underway: a street sweepers get to work as a man puffs on his cigarette, perhaps on his way to the metro. We then travel across eastern Europe, the middle east, Asia, Australia, north and south America…indeed around the world. The book’s simple, beguiling subject is portrayed in playful, imaginative, information-rich and distinctly child-friendly images. Clotilde Perrin creates her images in pencil and then with digital colour. The text functions largely as a caption. As an Australian reader of course I was curious to see how we would be represented. Of course any creator is going to use broad cultural gestures, but I must confess to being a little disappointed that Uluru is still being called Ayres Rock, the site has had a dual name since 1993. Anyway, it seems like a missed opportunity to more appropriately acknowledge the rock’s Indigenous heritage. Also, the text informs us that it is four o’clock in the afternoon, and Kate drives toward the beach…so it’s going to be a long afternoon for Kate. That said, the book isn’t striving for strict accuracy and still succeeds in conveying the idea of one world marked by time zones. As well as exploring the idea of a continuous now, At the Same Moment Around the World introduces the reader to details of daily lives: climates and weather, a range of homes, architecture, animals and activities. There is another technical challenge for the illustrator to overcome. Since each page is a different place there is no double page spread and so Perrin has needed create images that blend places that are otherwise isolated and distinct. Yet she stitches it together as a suitably seamless whole. The large number of scenes taking place at night also presents a challenge for the illustrator. On the whole Perrin resolves this with scenes of quiet nighttime activities (getting ready for bed, kissing goodnight, a baby being born). And when we turn the final page we see a ship sailing into shore at five o’clock in the morning ‘when Chloe finds herself tired from dancing all night’. It is of course also the first image in the book. Which brings me to the two bonus elements of the book. Did you know that time zones have been in practice for less than 150 years? A brief history of timezones and time keeping explains that it was the coming of the telegraph, where great distances were joined at a keystroke demanded a more cohesive sense of time, sharpened the need to more accurately measure time. (In that sense, the illustrations for each page might cause us to reflect on the idea of ‘local time’ and the urgency, or otherwise, with which tasks are done or events unfold.) This part is a little more technical than the heart of the book. And then the showstopper: a handsome fold out map that unites the whole adventure and reintroduces the children we have met on our journey around the world. What are you waiting for? Clotilde Perrin studied illustration at l'École des Arts Décoratifs in Strasbourg. As well illustrations for numerous magazines and newspapers including Astrapi, J’aime Lire, Les belles Histoires and magasine XXI, she has illustrated more than 30 books for a variety of publishers. Clotilde has also written and illustrated seven more personal books. Her work is celebrated for its poetic, imaginative force. Beneath an apparently simple surface her works are fine and detailed, with sparing and sensitive metaphorical elements in atmospheric settings. Her many and inventive compositions and landscapes are populated with endearing characters and her stories shaped with a touch of surrealism. A great example of Clotilde Perrin's imaginative world can be seen in the film clip from her 2009 exhibition. Creating something simple is always a lot harder than it looks. Rather than being the first thing that pops into your head, capturing the essential elements is usually the end result of years of refinement. What could be more fundamental to a picture book than the question of colour? Hervé Tullet has been publishing since 1994 and latest book is a joyful demonstrates that simple doesn’t mean easy. Mix It Up is a massive invitation to young children to discover and create. Here is a mess with a meaning as the young reader experiences the magic of mixing colours. Young readers will discover what happens when blue contacts green, or red contacts blue by the pressing and turning of pages. They not only see but also make the magic happen. It’s this invitation to be physically involved in handling the book-as-object that makes Mix It Up much more than just another book about colours. It’s a magic lantern of a book: a game, a lesson, an object, and a road to discovery. Rub, press, flip and reveal – for most children, their first wish will be to do it again. There is sophistication buried beneath the surface simplicity and adult readers will marvel at the magic, too. As adults, we rediscover the joys felt when we first mixed colours. This is a book that, as a shared experience, offers moments of wonder. Children putting brush to paint and paper will use the discoveries to experiment and learn for themselves. They will want to get mixing and experimenting right away. And you will want to join in too. Hervé Tullet was born in Normandy and grew up in Paris. He studied fine art and decorative arts, publishing illustrations in magazines before his first book Comment Papa a rencontré Maman appeared in 1994. In 1998 won the Bologna International Prize for Non-Fiction for Faut Pas Confondre (Must Not Confuse). Now with more than 60 books published, Tullet is read and enjoyed in more than 25 languages. His work explores the possibilities of the book: how we read it, how we make meaning and how we can interact beyond just words or images. Tullet's book re-inscribe the presence of visual language in our lives. “When you are starting out (as a child) you are learning a verbal language and a visual language at that same time, and they are more easily kind of related to each other. As the verbal language triumphs the visual one fades and you become inhibited and you don’t want to do it and you don’t want to show that you don’t do it as well as other people." For a complete list of books in English, see Hervé's website. Hervé Tullet shows you how. The first thing to say about The Rabbit and the Shadow is that it’s a perfect combination of illustration and word. The story begins in the close, loving relationship of a large, protective stag and the young, vulnerable and lively rabbit. A few brief pages modulate their bonding, discovery, joy, harmony – and the possibility of separation. Their relationship presents all of the complex emotions that love and parenting – and being a small child – entail. The story introduces, in a most sinuous and twisting path, their bond of love and “a Soldier at war, a Cat who keeps having the same dream, a Book who wants to know everything, and a Shadow”. “Of climbing volcanoes,” said the Rabbit. “Yes! Of climbing volcanoes!” shouted the Soldier. Using short chapters, the story doesn’t unfold in a straightforward way, as it weaves in the fears and dreams of each character. This includes a conversation between the Rabbit and the Stag that is a key to the Rabbit’s journey away from home. Very elegantly and gently the book introduces the idea of growing old and dying, but also of family, memory and love. Ultimately The Rabbit and the Shadow is a remarkable and unforgettable celebration of love. The eccentric touches never become cloying, the philosophy never navel-gazing. Perhaps the free brushwork and sinuous line keep any outward appearance of seriousness in check. It is a kind of Runaway Bunny tale that comes from a deeply felt place. Mélanie Rutten’s illustration uses a full colour palette from deep rich burning reds to cool forest browns and greens, as she creates a complete world. Deep nighttime blues contrast with the vivid golds and a skillful use of white space. The visual rhythm balances intimate and nuanced cameo images with full-page sumptuous full pages and two significant double page spreads. There is an effortless harmony throughout, that amplifies the reading pleasure. Born in Belgium, Mélanie spend much of her childhood in Central America and Africa before returning to Belgium as a teenager. She studied photography in Brussels. Although her illustration work is largely self-taught, Mélanie studied with Kitty Crowther at La Gaumette, a centre for creativity. Her previous books for the French publisher éditions MeMo include Öko, un thé en hiver and Mitsu, un jour parfait. About the translator: Sarah Ardizzone is an award winning translator of French literature. She has translated books by Alain Mabanckou, Daniel Pennac, Timothee de Fombelle and Joann Sfar. She told the website Publishing Perspectives that her strengths “are dialogue and something that feels contemporary and alive”. Both qualities are very much to the fore in The Rabbit and the Shadow: while there is something classic about the story it always feels immediate and original. It was in a small, stylish graphic design bookstore near Canal St Martin where I first encountered the work of Janik Coat. That book, Je ne suis pas comme les autres, is not yet in English. There is something hard to capture in English, but it is brilliant: simple, funny and elegantly designed. The same can be said of all of Janik Coat’s work, which has appeared in a steady supply from some of France’s most creative publishers for the past decade. Strictly speaking Rhymoceros is not a ‘French book in English’ since the US edition with Abrams Appleseed is the first publication. But the stylish look and execution is all French. A previous book, Hippopposites, appeared with the same publisher to acclaim in 2012. Coat’s unique skill is to take a very simple concept – pare it back to an emblematic visual image – and then let the imagination run free on wordplay and visual nuances. The theme here is rhyme – and the interplay of sound and image offers constant delight. While the rhymes are simple – often just single words – the images have a degree if information to make the reading experience something of treasure hunt. Even on the simple, repeated template there are subtle clues and questions. Some additional touch-and-feel pages are used sparingly (the book is the better for that), making the experience a highly engaging one. Rhymoceros is a great book for parent and child to share, not only because adults will enjoy the simple yet sophisticated design. Parents will also welcome the invitation to seek-and-say so stylishly presented. That hippo’s blue silhouette carries extra information that both readers will enjoy puzzling over and finding and making connections. While I would love to see Je ne suis pas comme les autres in English, Rhymoceros will do very nicely in the meantime. Born in 1972 in the Breton city of Rennes, Janik Coat studied at Beaux-arts de Nantes. She has published with some of the most creative houses in France including Editions MeMo, helium and Autrement. Coat’s work often begins in traditional media before translating to digital design. (How else to create those perfect curves?) Her first book, Popov et Samothrace, appeared in 2005. Animals are a constant subject in her work. The book begins with a hand-drawn map of Paris, held by paws, inviting the reader to play the role of the lion. Making a new home in a big city, or coping with any major change, takes time. So the lion needs time to get to know Paris as he visits some very recognizable sites. But people mostly seem uninterested or unimpressed. Some carry a strange kind of sword under their arms, and the weather gets him down. And, hey, a lion likes to be noticed. At last, a girl notices him “and her eyes followed him for a while with loving, tender look”. Of course with Paris as a backdrop things can look easy. And yet Beatrice Alemagna is able to give many of the familiar places and ideas a fresh new twist. The images combine collage, pencil, pen and brush and this mixed media roughly translates the diverse textures of the city, while the text employs some gentle, sly humour. Her design is uncluttered, like a stage set upon which this drama can play out. The perspectives and scale of figures in the streetscapes skillfully modulate the lion’s initial discomfit and his growing adjustment to new surroundings. The double page image of the Eiffel Tour has an especial lightness and brio. But I think what makes A Lion in Paris really succeed is the way the lion carries the same curiosities and anxieties we all do (children and adults), in facing new situations. The lion is brave and vulnerable, curious and anxious. But ultimately the story achieves a resolution that satisfies the mind and the eye. Familiar places are borne along by the story’s emotional weight. Winner of the Bologna Ragazzi Special Mention Award in 2006 it has taken eight years for the book to appear in English and I’m not sure why. I can only conclude that’s arrival is a sign that the English language world is really waking up to what French illustrators are capable of. In France a picture book is an ‘album’ (l’album), and with A Lion in Paris this seems particularly just. It’s big (385mm x 290mm), landscape, and tucks under the arm like an artist’s folio. It opens from the top, and in the hands of a child, it’s lion-sized. Early years picture books don’t come much more charming than In This Book: a winning combination of simple words and bold visuals. The book begins: I am in the poppy, said the bee take the viewer through everyday and adventurous places: forests and farms, kitchens and clouds. That simple statement I am in the… invites the listener to identify closely with each image. These include a tiger, lighthouse keeper, a scorpion, a swimmer, a snail, a tractor, a hammer a sleeping dog. It’s a generous and frequently surprising list. In This Book gives voice to the natural and intimate world of the young child – where the boundary the human and natural worlds can be very thin indeed. Joëlle Jolivet’s images have a look of being made as linocuts, although some are (I think) purely digital. The overall feel is of something very hand-made and personal. The double page spread of a prowling tiger is one of many striking pieces, the tiger’s stripes mingling with the forest leaves. Jolivet’s eye for space and colour, her simple sweeping lines and bold contrasts touched here and there with detail and texture makes for continuously enjoyable reading. Playfulness and surprises spring also from the contrast in subjects and images, flipping from a seed in the ground to a baby in a stroller, to a butterfly in a net. The apparent randomness captures the way a child encounters the world: immediate, tactile, curios and speculative. But In This Book all ends satisfyingly – wherever we have been and whatever we have seen – with the child sleeping nested in a parent’s arms. Joëlle Jolivet is perhaps best known for her illustrations in 365 Penguins (text by Jean-Luc Fromental, naïve, 2007), which became a worldwide hit and Zoology, another oversized high impact picture book. In that sense, In This Book could serve as a more modest introduction to those bigger, more intensely illustrated books. Either way, In This Book is a lasting pleasure. Joëlle Jolivet studied first at L'école supérieure d'arts graphiques Penninghen and then graphic art and advertising at the School of Applied Art in Paris (Arts Appliqués de Paris). Her interest in engraving and printing led to a year in the lithography workshop at the School of Fine Art (Ecole de beaux arts) in Paris. This led to lino-cutting, which has remained her main mode ever since. See Jöelle at work in her studio, including working with her ancient printmaking tools.